Crock pots are also known as slow cookers, because that is what they do; they cook your food slowly over as much as eight hours and as little as four hours. You can put your meal on and leave for work in the morning and have dinner ready when you get home. Slow cookers are safe because they cook at a low slow rate with the meal in added liquid at between 160-300 degrees with the temperature rising to 300 degrees slowly over the four to eight hour time frame. 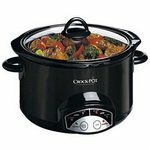 Most crock pots are electric and they come in various sizes and shapes from small slow cookers to huge roasters that can cook chicken, beef, and pork to fall off the bone tenderness, meat that is well seasoned and succulent in its own juices. Some other foods that can be cooked are soups and stews, casseroles, puddings, pies, cakes and cookies, and they can also make hot beverages such as mulled apple cider, hot chocolate, and hot buttered rum and be kept warm for hours on the keep warm setting. These cookers are also nice for carrying to a gathering where it can be plugged in just like at home, many of them have optional carrying cases that also retain heat until you get to your destination and plug it in again. The pot which is placed inside of the heating element is generally ceramic or similar material porcelain excellent heat conductors and heat retention qualities. When looking to purchase a slow cooker it is good to look for one that has at least a six quart capacity, insert handles for placing and removing the ceramic pot from the heating element, a clear lid for monitoring of the food, one that has a dishwasher safe pot and lid, and a “keep warm” setting with timer. These cookers come in a variety of price ranges depending upon what features you may want as well as depending on the size and shape.